Nob Hill was originally called Fern Hill, and is so steep that horse-drawn wagons could barely make it to the top. As late as 1870, there were only two modest houses on it – one belonging to a doctor, the other to an undertaker. 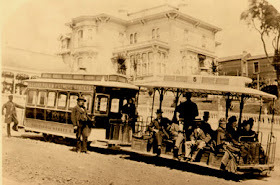 It was difficult to get people or supplies up Nob Hill until 1873, when inventor Andrew Hallidie built a cable car line up Clay Street, the first in the world. That same year, General David Colton, a lawyer and vice president of the Southern Pacific Railroad, built the first mansion on the hill, on what is now Huntington Park. The California Street cable car, opened in 1883, was the city's the third cable line. Today, it's the oldest of the three lines still in operation. By 1880, three of the Big Four -- Stanford, Crocker and Hopkins -- had built enormous mansions here, an incredible display of unimaginable wealth acquired by building railroads. People started calling it Nob Hill, “nob” being a slang term for a person with extravagant wealth. 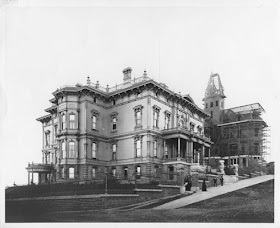 Only two structures remained standing after the fire in 1906, both made of stone: the sandstone mansion of Silver King James Flood, and the grey granite shell of the newly-built Fairmont Hotel. 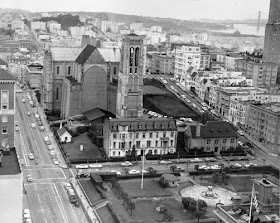 The Crocker family donated the property where their house once stood to their church, Grace Cathedral. The Huntingtons, who had taken over the Colton mansion, provided space for a park. Luxury hotels and apartment houses were built on the remaining properties. 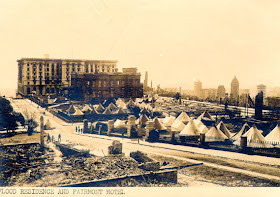 Tents on the ashes of the Huntington and Crocker Mansions, in front of the ruins of the Flood mansion and the Fairmont Hotel, 1906. As partners in Central and Southern Pacific Railroads, each man played a specific role. Stanford was the politician. Huntington the financer and Washington lobbyist. Crocker was in charge of construction. Hopkins, the trusted elder, kept the books.These men controlled business and government in the Western United States for over fifty years. 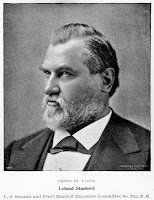 Perhaps the most ruthless of the Big Four, Huntington was the railroad’s financier and lobbyist. He grew to dislike his partners and spent most of his time in New York, managing money and influence. Born on a farm in Connecticut, Huntington came to California as a travelling peddler during the Gold Rush. He became partners with Mark Hopkins in a Sacramento hardware business. His nephew H.E. Huntington became president of the railroad after his uncle’s death. Called “Uncle Mark” by his partners, Hopkins was known to be thrifty, some would say miserly. 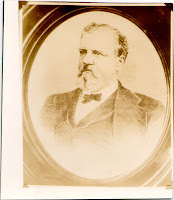 He was treasurer and chief accountant of the Central and Southern Pacific. Born in upstate New York, Hopkins came to California in 1849 and started an iron foundry in Sacramento. He later partnered with Collis Huntington in a hardware business. He was the only one of the Big Four that never lived on Nob Hill. He died before his mansion there was completed. A lawyer from a wealthy New York family, Stanford had a successful law practice in Wisconsin. After a fire destroyed his office and large law library, he and his wife Jane came to California in 1856. His legal experience made him a good choice to be President of the Central Pacific. He built a strong political machine in the West, serving as Governor of California and later U.S. Senator. He and his wife founded Stanford University to honor their only son Leland Jr. who died at age 15 of typhoid fever while the family was traveling in Italy. Crocker came to California from Indiana by wagon in 1859. He settled in Sacramento and opened a dry goods store. Although Crocker had no experience in building, his partners put him in charge of construction. He was notorious for squeezing his subcontractors on price and holding them to impossible deadlines. 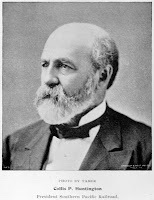 Crocker's oldest son, William, founded Crocker Bank. Theodore Judah is the unsung hero of the western railroad. It was Judah's vision and planning that made it possible for the Big Four to build the rail line through the Sierra Nevada mountains. Judah was a civil engineer and a surveyor from Connecticut. 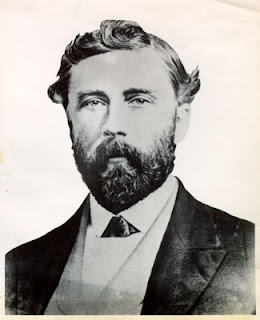 He came to Sacramento in the 1850s to work on the Sacramento Valley Railroad. He was surveying a wagon road through the Sierra Nevadas when he discovered a feasible path for a railroad line through the Donner Pass. With financial backing from four Sacramento merchants – Huntington, Hopkins, Stanford and Crocker – Judah headed to Washington, D.C. In 1862, President Lincoln signed the first of five Pacific Railway Acts granting the partners right of way and government financing to build a railroad west along Judah’s route. Judah returned to California to find that his four partners had put Crocker, better at bribery and cutting corners than Judah, in charge of construction. Furious, Judah sailed back to New York to look for financing to buy out the Big Four and reclaim his railroad. He died of yellow fever on the ship. In 1876, Leland Stanford, president of the Central and Southern Pacific Railroads, built a $2 million mansion on this site, the largest home in California at the time. The gray stone retaining walls surrounding the property, and the Stanford name, are all the remain from that mansion today. Jane Stanford owned the property until her death in 1905. 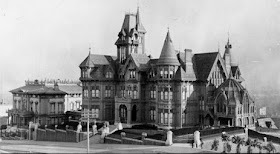 After the mansion burned to the ground in 1906 Earthquake and Fire, the property was sold to a developer who built the current building as luxury apartments. In 1970s, it was remodeled and re-opened as a hotel. The hotel underwent an extensive renovation in 2008. Hopkins was a miserly man with simple tastes, but apparently the same was not true of his wife, Mary. In 1875, Mary began construction of a house on the hillside property behind Stanford's. Three years, $3 million dollars and several architects later, she moved in alone. Mark died before the house was complete. Mary Hopkins soon married an artist who had helped her design the house named Edwin Searles. The couple moved to the East Coast and began building another mansion there. When Mary died in 1891, Searles donated the house to the University of California for use as an art school and gallery, the Mark Hopkins Institute of Art. After the mansion burned in 1906, the Art Institute re-built a smaller building here. In 1925, it moved to its current location on Lombard Street. The Nob Hill property was sold to developer George D. Smith who built the current hotel. In 1939, the hotel's penthouse suite was converted into the Top of the Mark bar and restaurant, offering a 360-degree view of San Francisco. It became a popular gathering place for soldiers during World War II. Wives and girlfriends would stand along the northwest windows to watch the ships sail out through the Golden Gate. It soon became known as Weeper’s Corner. Silver Bonanza King James Flood was almost sixty years old when he began planning this house. He lived in it less than a year before he died. Impressed with New York brownstones being built at the time by the Vanderbilts and others prominent families, Flood had the pre-cut sandstone exterior brought by ship from Connecticut. It’s said that Flood employed one man full-time to polish the bronze fence, which now carries the graceful patina of age. 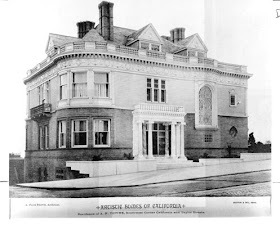 After the home was gutted by fire in 1906, Flood’s daughter Cora sold the wreck to the Pacific Union Club. The Club held an architectural competition, but the winning design by Albert Pissis called for lots of white marble and proved too expensive. The project was then turned over to Willis Polk, the only competitor willing to work with the existing structure. Polk added a third floor and built semicircular wings on the east and west sides, using brownstone imported from the original quarry. The interior of this very exclusive club includes five dining rooms, a swimming pool, a squash court and well as hotel rooms for the all-male members. The Comstock Lode was one of the largest veins of silver ever found. Its discovery in 1859 made fortunes for men like William Ralston, William Sharon and George Hearst. In 1873, when everyone thought the Comstock mines were tapped out, another huge vein of silver was found. This Bonanza Strike made instant millionaires out of the four partners who owned the Consolidated Virginia Mining Company. Flood was a New Yorker who came to San Francisco during the Gold Rush. Unsuccessful at mining like most, he partnered with William O’Brien to opened The Auction Lunch Saloon, on Washington St. in the financial district. Flood began to trade stocks using information overhead from the businessmen in his bar. Soon Flood and O’Brien became full-time financiers. In 1868, Flood and O’Brien agreed to provide the financial backing for miners Fair and McKay to further explore the Comstock Lode. His son, James L Flood, was a real estate investor who built the Flood Building downtown. O’Brien distanced himself from his partners, preferring a simple, quiet life. Less than five years after the Bonanza strike, he died of diabetic complications, then known as Bright’s disease. 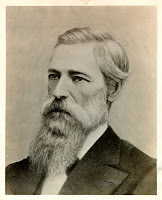 James Fair was an Irish immigrant, who had been a mine supervisor before forming Virginia Consolidated Mines. After striking it rich, Fair spent most of his life steeped in scandal which continued on for years after his death. Fair had a well-earned reputation as a woman chaser. When his wife divorced him in 1883 after 20 years of marriage and four children, he continued to carry on very public affairs. 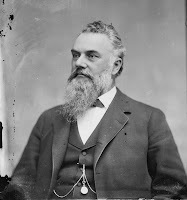 After Fair’s death, his children spent years fighting over his estate with a woman named Nettie Cravens, who claimed a secret marriage to Fair. His oldest son James died of heart problems after receiving a controversial treatment for alcoholism. His daughter Tessie so disliked her father that she turned him away from her wedding. His son Charles was always in debt and was disowned by his father after marrying women of questionable reputation. The couple was killed in a car accident in 1902, which led to several years of gruesome headlines while their heirs fought in court over who had died first. Photo by Matthew Brady , Courtesy: Library of Congress Prints and Photographs Division. Brady-Handy Photograph Collection. 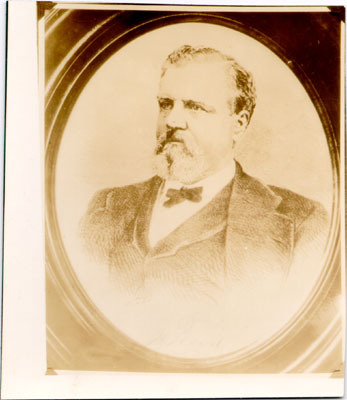 McKay was the richest of the Bonanza Kings because he owned two-fifths interest in the mine, having bought out an early fifth partner named Walker. Like O’Brien, Mackay left daily operations of the company to Flood and Fair. In 1866, he used his fortune to escape to Paris with his new wife. In the 1880s, he formed a communications company that laid two trans-Atlantic cables, increasing capacity and driving cable rates down. He was involved in planning the first trans-Pacific cable, completed after his death. This was once the site of the first mansion on Nob Hill, built by General David Colton., vice president of the Southern Pacific Railway. When Colton died unexpectedly after being thrown from a horse, his Big Four partners cheated his widow out of her share of the railroad and Collis Huntington took over the house. The mansion was painted white to resemble marble, but was actually made of redwood. When it burned in 1906, Huntington’s widow gave the property to the city for a park. The Huntington Hotel across the street is also named for the Railroad Baron, but was the site of the Tobin house before 1906.
now site of Grace Cathedral. The frieze on the modern façade is by California artist Emile Norman. The 12-foot high figures represent the branches of the U.S. Armed Services, each in a gold crypt to honoring their sacrifices. The smaller figures remind us of the global tug of war between good and evil. Peek inside the glass front doors to view Norman’s enormous colorful glass mosaic which depicts the contributions of Masons in California. The artist used 180 colors of stained glass plus bits of metal, parchment, shells and other materials pressed between two sheets of glass. The lower section contains soil and gravel samples from all 58 counties in California. The 3000 seat auditorium is a popular concert venue, designed so that no seat is more than 21 rows from the stage. There is also a 16,500 ft exhibit hall for conventions and other special events. 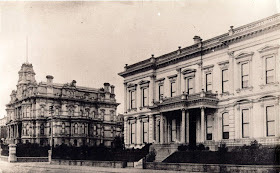 Where the Masonic center stands, on the southwest corner of California and Hyde, was once the mansion of A. Towne. 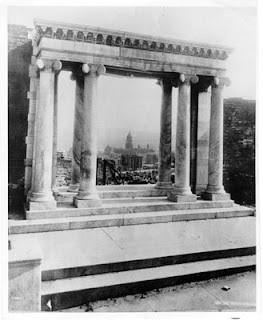 When the Towne mansion burned in the 1906 fire, the doorway remained, framing a view of the ruins of downtown. Called Portal to the Past, the doorway was transported to Lloyd Lake in Golden Gate Park where it stands today. Grace Cathedral is third largest Episcopal Church in the U.S. – St John the Divine in New York is the largest (and still incomplete), followed by the National Cathedral in Washington D.C. Designed in the Gothic style, the exterior is made of reinforced concrete hammered to resemble stone. Construction on the Cathedral began in 1910 but was halted in 1930 when funding ran out. A temporary wall was installed across the front to protect the finished portion. Th wall remained in place for 30 years until Ben Swig, the owner of the Fairmont Hotel, got involved. The Cathedral was finally completed in 1964. These doors depicting multi-layered, dimensional scenes from the Old Testament are an exact replica of those made for the Baptistry in Florence Italy by the great Renaissance artist. It took Ghiberti over 20 years to complete this masterwork. During World War II, a cast was made from the original doors which were taken and hidden for safe keeping. These replica doors were made from that cast and installed for the Cathedral’s dedication in 1964. In Florence, the original doors were moved to a museum for preservation in 1990 and replaced with replicas. Unlike a maze, a labyrinth has only one path and no dead ends. People walk the labyrinth as a tool for meditation or quiet thought; please be respectful of people walking around it during your visit. 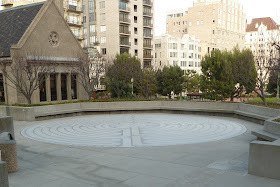 The outdoor terrazzo labyrinth was installed in 1995; the limestone one inside in 2007. Notice the difference between the windows in the back toward the altar and those closer to the front doors. The front windows were done in 1966 by the Willet Stained Glass Company, who also did the windows for the modern Cathedral of St. Mary's of the Assumption on Gough and Geary. The windows toward the back of the church were done by Boston artist Charles Connick in the 1930s using thinner glass, more subtle colors and painted images. The smaller windows along the top, done in 1970 by French artist Gabriel Loire, are known as the Human Endeavor series. Look for tributes to Frank Lloyd Wright, Robert Frost, Henry Ford, Albert Einstein and astronaut John Glenn. A four-year project to clean and restore all the windows was completed in 2010. This chapel, dedicated to the remembrance of all those who died of AIDS, welcomes all faiths. The three-part altar piece is by artist Keith Haring, who completed it just before his death from AIDS in 1990. 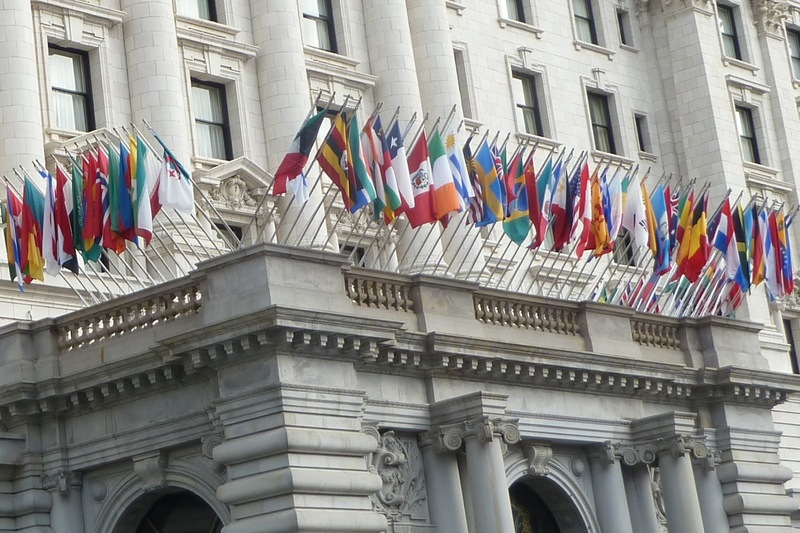 A changing display of sections of the AIDS quilt, started in San Francisco by activist Cleve Jones in 1987, can be found here, along with the Book of Remembrance listing names of victims of the disease. Grace Cathedral is open weekdays from 7 a.m. to 6 p.m. and weekends beginning at 8 a.m. Access may be limited during special services or events. Docent tours are available on Sundays after the 11 a.m. service, Saturdays beginning at 11:30 and weekdays from 12:30 – 2. Visit www.gracecathedral.org for more information. Hitchcock fans may recognize this apartment building. In Vertigo, Jimmy Stewart waits outside this building to follow Kim Novak as she drives out in her Jaguar. While many San Francisco buildings have trned into condos, the Brocklebank remains under rent control. This means rents stay low and it can’t go condo. It also means that residents rarely move out. The smaller Park Lane apartment building across Mason at 1100 Sacramento, also rent controlled, sold for $38 million in 2005, about $1.2 million for each of its 33 apartments. Enjoy the amazing view down Mason Street –it’s free. In 1902, when two daughters of Silver Bonanza King James Fair began construction of this hotel, they may have hoped to rehabilitate their family name. Theresa Fair Oehlrichs and Virgina Fair Vanderbilt, both married into wealthy, socially prominent families, but that was no thanks to their father. James Fair had divorced their mother and disgraced the family by having a series of very public affairs with working women. And when he died, he left a huge legal mess that involved two conflicting handwritten wills and two women claiming to be his wife. Construction went on for four years, and shortly before the new hotel was to open, the sisters sold it to brothers Herbert and Hanford Law. 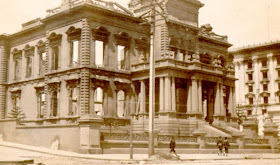 Just two weeks later, the hotel was gutted by fire caused by the 1906 Earthquake. Only the gray granite walls remained. The Law brothers hired architect Julia Morgan to rebuild the hotel which was opened in 1907, exactly one year after the disaster.. It quickly became a social hub of the city, hosting celebrity guests and events. In 1929 George Smith, owner of the Mark Hopkins Hotel, purchased the Fairmont and added a swimming pool, a novelty for hotels at that time. He also hired noted Art Deco architect Timothy Pflueger to design the Cirque Lounge with its distinctive wrap around bar. By the 1940s, the hotel was in decline when it was bought by investor and philanthropist Ben Swig. He hired celebrity decorator Dorothy Draper to redo the interior in the style of a Venetian palace, in heavy reds and golds. Most of Draper’s design work was removed in later renovations which are close to the original design. In 1947, Swig opened the Venetian Room as a nightclub, offering big name entertainers like as Nat King Cole, Ella Fitzgerald, Sammy Davis Jr., and of course Tony Bennet, who sang “I Left My Heart..” for the first time here in 1962. Just two blocks down Mason Street toward the Bay, the Cable Car Museum provides a look into the inner workings of the cable cars and their history. See the mechanism that keeps the cables moving underground and take a self-guided tour of historic photographs and artifacts, including three complete cable cars from the 1870s. Most of what is now downtown San Francisco was once underwater. Up until the 1850s, a shallow inlet, called Yerba Buena Cove lapped the shore at Montgomery Street, where the Pyramid now stands.Buried underneath many of the modern office buildings in the Financial District lie the remnants of at least 40 Gold Rush era ships. Today, every construction project in the Financial District must have an archeologist on call to document whatever historical remnants may be uncovered. On this tour, you’ll learn what they've discovered, find gold and understand the history lies beneath the pavement. The Niantic was a three-masted whaling ship that was abandoned here in 1849 when her crew ran off to search for gold. The hull was used for a warehouse and store, and the shallow water around the ship was quickly filled in with sand dug up from the surrounding streets. A fire in 1851 gutted the ship and the Niantic hotel was built over the charred hull. Since then remains of the Niantic have been uncovered three times. The first time was in 1872, during construction of a brick building on the site, when a dozen bottles of champagne were found. The second time was during rebuilding after the 1906 Earthquake and Fire. Then in 1978, the remains of the hull were uncovered again, while the current building was being built. Artifacts from the Niantic, including the captain’s log, are in the San Francisco Maritime Museum. Walk on to Samsone Street and turn right (south). Commercial Street lies along the footprint of Long Wharf , the earliest and longs wharf in Gold Rush-era San Francisco. Long Wharf stretched from the shoreline on Montgomery Street out into Yerba Buena Cove to where the Ferry Building is today and was the center of the business district. Abandoned ships were permanently tied to the Wharf and used as warehouses, stores, hotels and brothels. Today Commercial Street is lined with restaurants, making it a popular lunchtime stop. Notice that Commercial St. ends here at Sansome and continues as a pedestrian walkway. Follow the path between the line of trees to a stairway that leads into the Embarcadero Shopping Center and, eventually, to the Ferry Building. Avoid the stagnant pond underneath the stairs. The historic Federal Reserve Building dates from 1924 and was designed by architect George Kelham, who also did the art deco Shell Building further down Sansome at Bush. The banking hall now houses law offices and event space rented out for weddings, proms and other parties. Enter from Sansome Street and take a sharp right into a dimly lit exhibit of broken bottles, torn pictures, tools and other Gold Rush junk. It's displayed in the original elevator lobby, remodeled in 1930 Art-Deco style with a gilded ceiling. When you’re done squinting at the exhibit, take a right at the security desk to the working elevators in the 1990 wing. On the 15th floor is a public garden offering seating, tables and a view. The park is open to the public only on weekdays during business hours. Turn left out of the Sansome St. exit and walk south to California Street. Affectionately called the Old Gray Lady of California Street, this granite banking temple was under construction during the 1906 earthquake and finished the following year. Inside is a massive banking hall under a lofty coffered ceiling. Go down the stairs to a small museum that tells the story of the Bank and its founder, William Ralston, and includes gold nuggets, early gold coins, and a check signed by John Muir. Open weekdays during banking hours only. Hundreds of hitching posts like this one once lined the street of downtown San Francisco. This is the last one remaining. It once provided a convenient place to tie up your horse while you did your business. A door on one side, now kept locked, once held feedbags for horses to munch on while waiting. This building survived the 1906 Earthquake and Fire so well that it is reported to have provided water and power to surrounding buildings. Julia Morgan had her office in this building and reportedly helped re-design the lobby. In the back lobby, the original trading floor is now a bank. The murals are the work of famed seascape artist William Coulter. Painted between 1909 and 1920, and rediscovered during a 1907s renovation, the scenes are of Port Costa, Honolulu Harbor and the Golden Gate, before the bridge. On the far left wall is a mural by Norwegian artist Nils Hagerup of the Gjoa, the first ship to successfully navigate the Northwest Passage. Piloted by famed explorer Roald Admunsen, the Gjoa took three years to make its famous journey. The exhausted crew arrived in San Francisco in October 1906 to find the city in ashes. They returned to Norway on a commercial steamer, leaving their crippled ship behind. The Gjoa was displayed in Golden Gate Park, where it deteriorated further. In the 1970s the ship was returned to Norway, where it rests in the Maritime Museum in Oslo. Turn right out of the Merchant's Exchange, cross California Street and continue north on Montgomery. 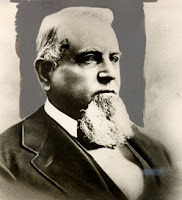 In the summer of 1852, Samuel Carter, an experienced express agent and Rueben Washburn, a Syracuse banker, arrived in San Francisco. They opened the first Wells Fargo office on Montgomery Street, on the same site the museum occupies today. Henry Wells and William Fargo stayed home in New York. Many years later, they each made one brief visit to San Francisco. Inside are lots of interactive exhibits on the history of California and the west, plus the chance to feel what it was like to take a ride in a real stagecoach. It’s popular with school groups, so the best time to visit is often late in the day. Exit Montgomery Street and turn left to head north. Wells, a noted dealmaker, was appointed president of American Exrpess. Fargo, the youngest of the partners was the secretary. and Fargo , was secretary of American Express. Butterfield controlled the Board. Fargo was much younger than his partners and aggressively competitive. He and the older, more conservative Butterfield frequently clashed. In early 1852, Fargo developed a plan to deliver mail and small packages throughout the the west. Predictably, Butterfield opposed Fargo’s plan, and got the board to vote it down. Fargo enlisted Henry Wells to raise money to back a new company. On March 18, 1852, Wells and Fargo met with a group of investors in an elegant New York hotel to form Wells, Fargo and Co. Both Wells and Fargo remained kept their positions in American Express while hiring others to develop their western venture. Each man visited San Francisco only once. Wells crossed the Isthmus of Panama by mule to reach San Francisco in 1853, but only stayed three weeks before returning home. Fargo served as mayor of Buffalo, New York. This building, which dates from 1908, was the first headquarters of A.P. 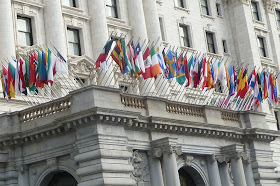 Giannini’s Bank of Italy, which became Bank of America. Inside the original tellers cages still carry insignia with the initials of the Bank of Italy. The small vault opposite the entrance is a reminder of Giannini’s post-earthquake promise to always have money readily available to depositors. The carvings above this vault and the entryway were probably added in a 1921 remodel by John Powers. There is also a large vault with two doors downstairs in the basement.